This chapter will provide critical background on interpersonal trauma, how it became conceptualized as a harmful exposure and public health issue, and a discussion of the landmark Adverse Childhood Experiences, which illustrates the impact on health of early traumatic exposures. Next, we include a brief overview of the proposed pathways and mechanisms through which trauma results in poor health and health disparities. Interpersonal trauma may result in posttraumatic stress disorder which is a known mediator of adverse health effects. Next, the definitions, nature and prevalence of some common examples of interpersonal trauma are reviewed; these include childhood maltreatment, intimate partner violence, sexual assault, community violence, human trafficking, and historical trauma. This chapter identifies the ubiquitous nature of traumatic experiences and lays the ground work for clinicians and healthcare systems to better understand the need for trauma-informed care and the role it can play in promoting health and healing for individuals and communities. "Trauma". Miriam-Webster, [Internet]. 2018. Accessed 17 April 2018. Available from: https://www.merriam-webster.com/dictionary/trauma. Lester C. How childhood trauma affects health, July 13, 2017. Accessed 28 April 2018. Available from: http://blogs.wgbh.org/innovation-hub/2017/7/13/felitti-ace/. National Center for PTSD. PTSD Treatment White River Junction, VT. 2017, August 18. Accessed 15 May 2018. Available from: https://www.ptsd.va.gov/public/treatment/therapy-med/treatment-ptsd.asp. U.S. Department of Health & Human Services, Administration for Children and Families, Administrationon Children, Youth and Families, Children’s Bureau. (2017). Child Maltreatment 2015. Accessed 28 April 2018. 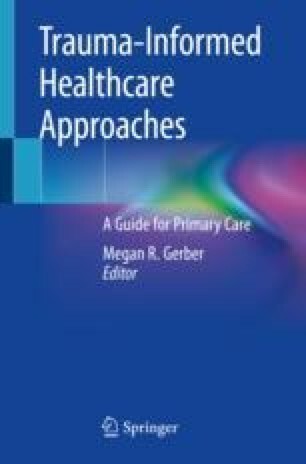 Available from: http://www.acf.hhs.gov/programs/cb/research-data-technology/statistics-research/child-maltreatment. Breiding MJ, Basile KC, Smith SG, Black MC, Mahendra RR. Intimate Partner Violence Surveillance: Uniform Definitions and Recommended Data Elements, Version 2.0. Atlanta, GA: National Center for Injury Prevention and Control, Centers for Disease Control and Prevention; 2015. Accessed 29 April 2018. Available at ​https://www.cdc.gov/violenceprevention/pdf/ipv/intimatepartnerviolence.pdf. Black MC, Basile KC, Breiding MJ, Smith SG, Walters ML, Merrick MT, Chen J, & Stevens MR. (2011). The National Intimate Partner and Sexual Violence Survey (NISVS): 2010 Summary Report. Atlanta, GA: National Center for Injury Prevention and Control, Centers for Disease Control and Prevention.​ Accessed 29 April 2018. Available at ​http://www.cdc.gov/ViolencePrevention/pdf/NISVS_Report2010-a.pdf. Walters ML, Chen J, & Breiding MJ. The National Intimate Partner and Sexual Violence Survey (NISVS): 2010 Findings on Victimization by Sexual Orientation. Atlanta, GA: National Center for Injury Prevention and Control,Centers for Disease Control and Prevention. 2013. Accessed 16 December 2018. Available from: https://www.cdc.gov/ViolencePrevention/pdf/NISVS_SOfindings.pdf. American Academy of Family Practice. Intimate partner violence. Leawood, KS; 2002, 2014 (COD). Accessed 22 June 2018. Available at ​https://www.aafp.org/about/policies/all/intimatepartner-violence.html. Basile KC, Smith SG, Breiding MJ, Black MC, Mahendra RR. Sexual violence surveillance: uniform definitions and recommended data elements, Version 2 Atlanta, GA; 2014. Accessed 29 April 2018. Available from: https://www.cdc.gov/violenceprevention/pdf/sv_surveillance_definitionsl-2009-a.pdf. American Psychological Association (APA). Violence and socioeconomic status 2018. Accessed 12 May 2018. Available from: http://www.apa.org/pi/ses/resources/publications/violence.aspx. Bureau of Justice Statistics. National Crime Victimization Survey (NCVS)/ Criminal Victimization, 2016. 2017, December. Accessed 30 July 2018. Available from: https://www.bjs.gov/content/pub/pdf/cv16_sum.pdf. United Nations Office on Drugs and Crime. Human trafficking 2018. Accessed 16 May 2018. Available from: https://www.unodc.org/unodc/en/human-trafficking/what-is-human-trafficking.html. Polaris Project. 2017 Statistics from the National Human Trafficking Hotline and BeFree Textline Washington, DC; 2018. Accessed 12 December 2018. Available from: https://polarisproject.org/2017statistics. United States Department of State. Trafficking in persons report 2018. Washington, DC; 2017. Accessed 30 June 2018. Available from: https://www.state.gov/j/tip/rls/tiprpt/2018/index.htm. United Nations Office on Drugs and Crime (UNODC), Global report on trafficking in persons. New York, NY; 2016. Accessed 12 December 2018. Available from: https://www.unodc.org/documents/data-and-analysis/glotip/2016_Global_Report_on_Trafficking_in_Persons.pdf. Polaris Project. Recognize the signs. Washington, DC; 2018. Accessed 25 June 2018. Available from: https://polarisproject.org/human-trafficking/recognize-signs. Breiding MJ, Basile KC, Smith SG, Black MC, Mahendra RR. Intimate partner violence surveillance: uniform definitions and recommended data elements, Version 2.0 Atlanta, GA; 2015. Accessed 28 April 2018. Available from: https://www.cdc.gov/violenceprevention/pdf/ipv/intimatepartnerviolence.pdf. Bureau of Justice Statistics. National Crime Victimization Survey (NCVS)/Criminal Victimization, 2016. 2018, October. Accessed 30 July 2018. Available from: https://www.bjs.gov/content/pub/pdf/cv16re.pdf. Polaris Project. The Facts Washington, DC; 2016. Accessed 1 July 2018. Available from: https://polarisproject.org/human-trafficking/facts. International organization for migration (IOM). UN Migration Agency, Polaris to Launch Global Data Repository on Human Trafficking. 9 September 2017. Accessed 16 December 2018. Available from: https://www.iom.int/news/un-migration-agency-polaris-launch-global-data-repository-human-trafficking. The National Child Traumatic Stress Network (NCTSN). Conversations about historical trauma: part three Rockville, MD; 2014. Accessed 30 June 2018. Available from: https://www.nctsn.org/resources/conversations-about-historical-trauma-part-three.